I have a confession to make! I have my neighborhood bar & restaurant on speed dial. They are essentially a mid sized bar, but they make such good food that I would recommend them to anyone craving cheap(er than a restaurant) and cheerful takeaways. Nothing ordered in the last 5+ years has disappointed. They make the best non typical Hyderabadi Biryani (which is spicy of-course, but also boneless), melt in your mouth Paneer Tikka and Palak Paneer and totally soul satisfying (oily) Indian Chinese. I do ask for the oil to be toned down. Why am I waxing eloquent about Holi Bar and Restaurant in a post on home made Chinese(y) food? Because although takeaway is a speed dial away, I generally try not to order food more than once a month. When the craving hits and my fridge is suitably stocked, I find ways to experiment and make it at home. Pair a saucy hot and spicy gravy with simple Sesame noodles or Rice steamed with one pod of star anise, and we are set. Cooking at the Escapades kitchen happens quite quickly. The most tedious chore however is chopping vegetables. So about once a week, when I shop for vegetables, I try and prep most of the vegetables which won’t wilt or spoil when cut, to speed up the cooking process during weekdays. Harder vegetables like beans, carrots, cauliflower etc get chopped up and stored. There was an assortment of vegetables chopped into bite sized chunks which I intended to make a stir fry out of, which I used for this dish. Steam the cauliflower, carrot and beans in a microwave for 5 minutes. Heat the oil in a pan and add the grated ginger and sliced onions together. Stir fry the onions till they have barely turned translucent. Add the sliced red and yellow bell peppers and stir, cover and cook for 2 minutes. Add the rest of the steamed vegetables after draining the water, cover and steam everything for about 2 minutes. The vegetables should be cooked but still retain crunch and colour. Stir together in a small bowl, the soya sauce, tomato ketchup, chilli sauce, sugar, vinegar and corn flour. Add ¼ cup of water to this and mix well, ensuring there are no lumps. Add this mixture to the steamed vegetables and mix. Simmer for another 2 minutes, while covered, till the gravy has thickened, sprinkle the pepper. Turn off the heat, check for salt and add if needed (the sauces have salt). 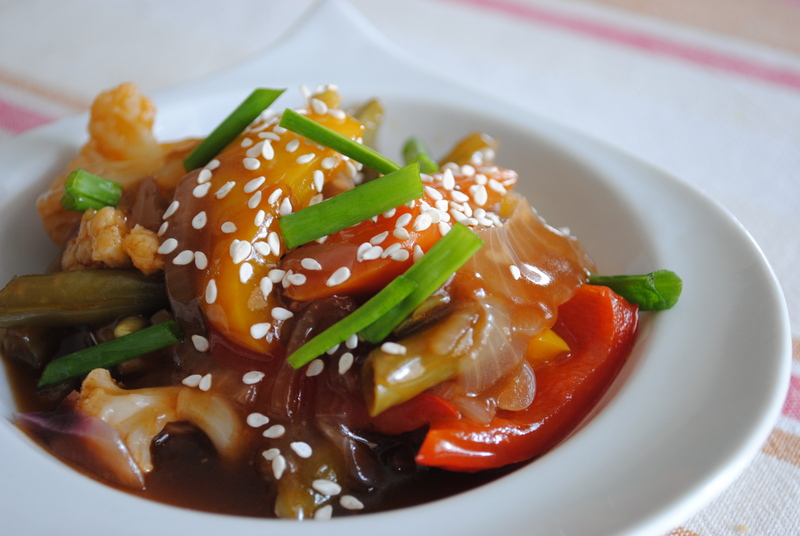 Sprinkle some sesame seeds, sliced spring onions and serve hot with steamed rice or noodles. Hi A!! How are you? 🙂 Sounds delicious! Isn’t easy to make chinese just the thing for a busy body like you? take care!